-Both during main game and Free Games in Highway King winning combinations on active paylines pay both directions: from left to right and from right to left. -The left-to-right winning combination must start from the leftmost reel and the symbol must be consecutively. -The right-to-left winning combination must start from the rightmost reel and the symbol must be consecutively. -If more than one active payline has a winning combination in Highway King, the winnings are added up. -Wild can replace other symbol and complete the winning combination with other symbol. 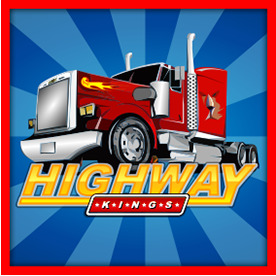 The Scatter symbols in Highway King do not have to occur on any particular payline. If there are 3 or more Scatters anywhere on the reels after a main game or a Free Games spin, the payout earned is multiplied by the total bet and added to payline winnings, if any.